Home/Brain Injuries/Could “Antifreeze” Molecules Be an Effective Treatment for Brain Injuries? According to Science Daily, a new study from the Perelman School of Medicine at the University of Pennsylvania shows hope that some brain molecules may actually help to treat brain damage. The Penn study was reported in the Neurobiology of Disease. The study focused on the molecules that help prevent certain proteins that are associated with cognitive decline. These molecules are chemically called N-acetylaspartate (NAA). NAA has, for a long time, been used as an indicator/marker that someone has a traumatic brain injury (TBI). Penn research neuroscientists now believe NAA can actually help treat brain injury and disease. Dr. Douglas H. Smith, who directs the Center for Brain Injury and Repair at Penn, believes NAA can act as an “antifreeze,” to stop and even reverse “the aggregation or misfolding of amyloid-beta proteins,” which happens after someone suffers a TBI. Dr. Smith even believes that NAA may help protect the brain from further damage. NAA is an amino acid. It is found in large quantities in the brain. 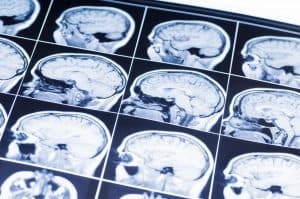 The Penn study showed the amount of NAA after a TBI falls by 20% in a patient’s white matter – as disclosed in proton magnetic resonance spectroscopy scans. The amyloid-beta proteins then rapidly clump into plaque. Many patients who die from a TBI, shortly after the inset of the injury, have a large number of these amyloid plaques. The study was able to show that amyloid-beta samples did help impair the clumping. The medical team is working to try to determine exactly how the NAA molecules are reducing the amount of clumping. They think the “NAA inserts itself between layers of amyloid-beta clumps and protofibrils, preventing the formation of mature amyloid fibrils.” The Penn researchers are using different techniques such as electron microscopy to help explain exactly why NAA can help reduce and even reverse the damage to the brain. Researchers hope this study will lead to a new line of research and to successful treatments for TBI and neurodegenerative disorders. At the Rocky McElhaney Law Firm, our Gladiators in Suits work to keep current with current advancements in traumatic brain injury remedies. In addition to our own study, we work with neurosurgeons and other doctors to understand your TBI diagnosis and what treatments may help. If you or someone you know is suffering from a TBI as a result of a person or company’s negligence, please call us at 615-246-5549 or complete our contact form. Our offices are located in Nashville, Hendersonville, and Knoxville, Tennessee. We can meet with clients in their home or at the hospital. At Rocky Law Firm, the focus is on taking care of our clients just like family – and fighting for them like family! We fight for you!